Sometimes you need a little shimmer and shine to get you through the week. 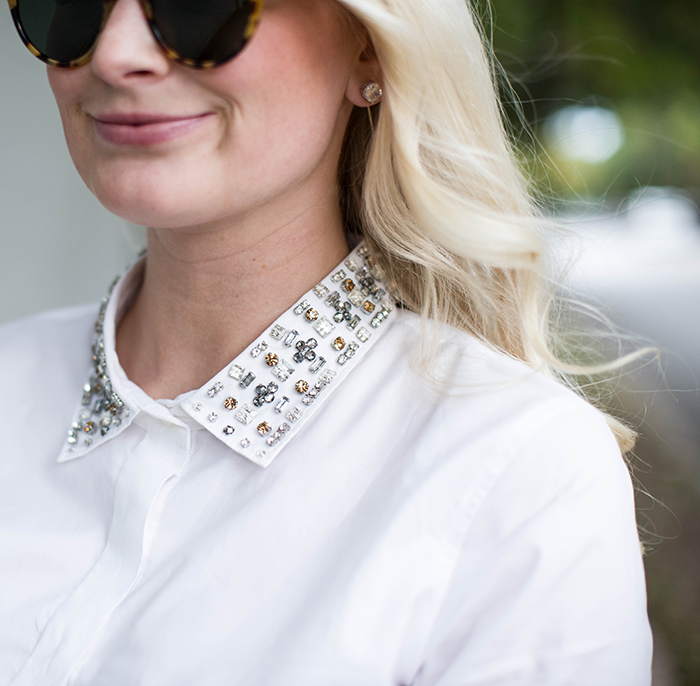 This jeweled-collar blouse by J.Crew does just that! It’s the quintessential work shirt with just a touch of flare to make your look pop. The shirt also makes a wonderful layering piece – can’t wait to have the embellished collar popping out of my favorite fall sweaters! Did I mention this beauty is on sale? 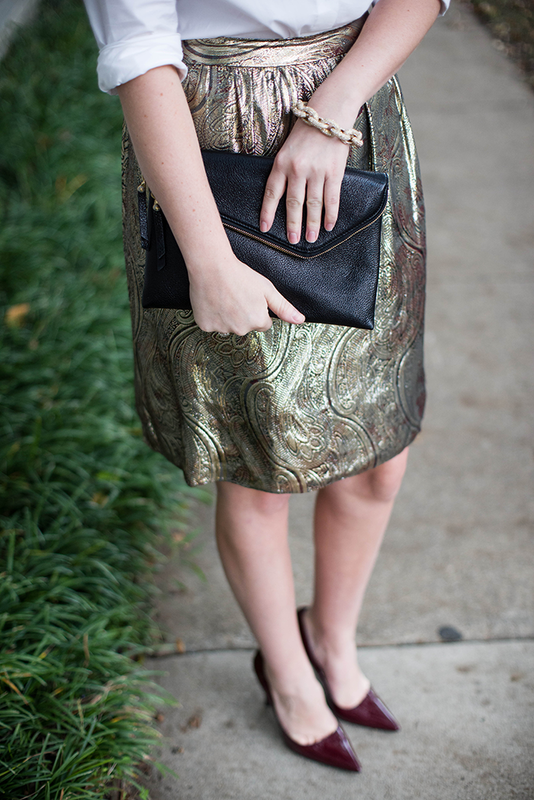 Another recent J.Crew purchase is this metallic paisley skirt – gorgeous, isn’t it? It’s threaded with burgundy, black and gold, so I know this piece will be incredibly versatile in my closet this season. PS: Remember when I mentioned adding this serum and this moisturizing mask to my nightly skincare routine? Well Dr. Jart is featuring me on their blog this week! Click here to check out the feature. That skirt is wonderful, I would so wear this outfit. You look gorgeous. Love the skirt on you! Such a great look! Love. Love. Love. And more love. Oh that skirt is gorg! I saw an embroidered skirt in an inexpensive non designer store here and it was $43.00 and looked super expensive. I was so tempted to buy it. But have had so many expenses in the past 8 months, new computer, new CS6, Ipad ($90 credit at BB that was expiring) and 4 grand on one tooth. So have to reign in the spending. that collar! can’t believe its on sale too. yes! Glamorous! Nice ensemble, perfect for the office. Happy Friday! I agree, and color as well. 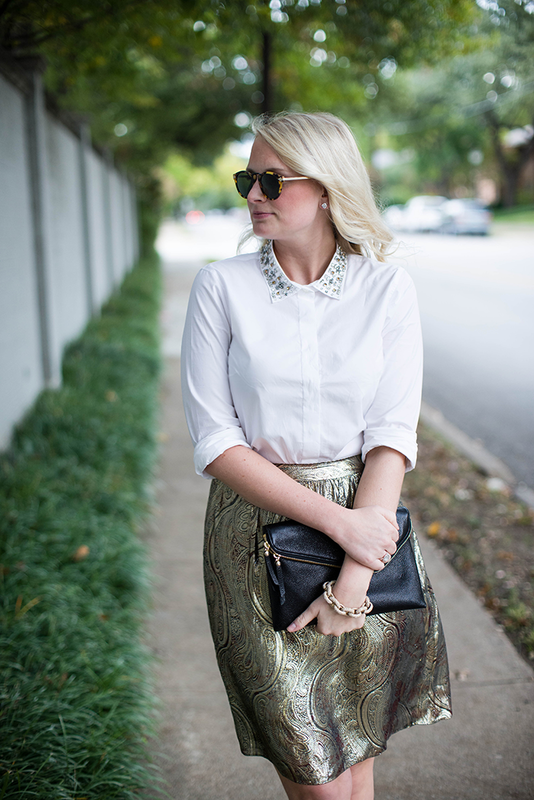 I adore that skirt and the jeweled shirt. Its a great combination and perfect for the weekend. You are looking so elegant and classy, very pretty. The skirt is so gorgeous on you! And I love the embellished top and Henri Bendel bag! Too cute! Wow, that skirt is gorgeous! Dr Jart! Skin savior of mine! Do you use the BB cream? I’m almost done with the water bb cream but wondering if I should go more heavy duty for the coming winter..
Gorgeous pieces! So perfect for the season and will be very versatile! That skirt it gorgeous!! And I love all things embellished! I can’t seem to get enough right now. I really love the clutch too. Have a great weekend! 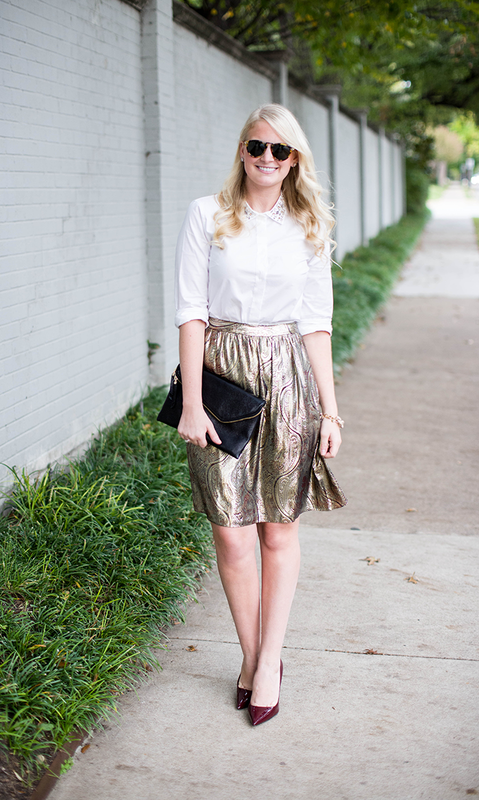 What an awesome combo–that skirt would be PERFECT for a Christmas party I’m going to! soo getting me in the mood for the holidays! As beautiful and elegant as always, Merritt! I absolutely love your sunnies. that skirt is amazing, merritt! good find – peeerfect for the holidays! Love when an embellished collar is popping out under a chunky knit. 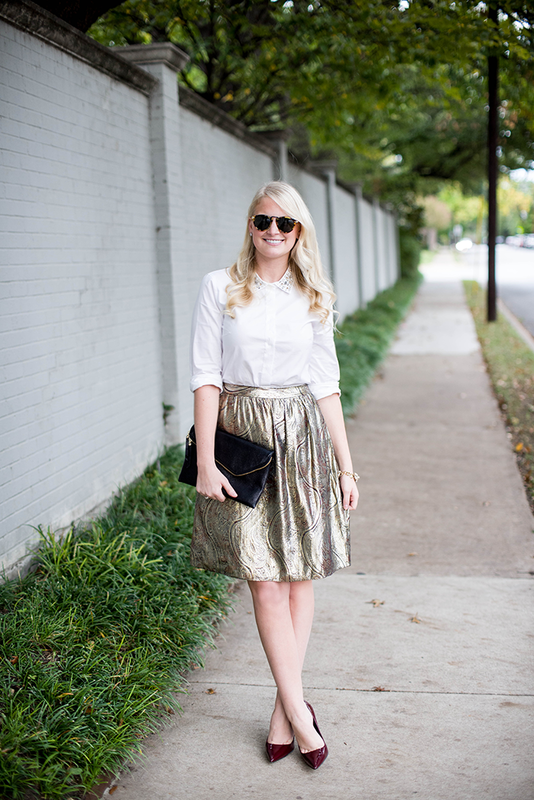 Love the j crew skirt! I need a change up from my pencil skirts. Love this!! The Zara shoes add the perfect amount of color!